The performances of various countries were held at 3 locations including the Hawaii Convention Center, Ala Moana Center and Waikiki Beach Walk during the festive period for 2 days on Saturday, March 10 and Sunday, March 11. 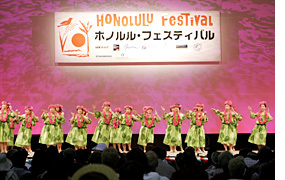 There was a lot of audience by the Festival Stage of the Hawaii Convention Center, which is used as a main stage for the Honolulu Festival every year. The participating groups presented various performances such as dance and others on a wide stage, which we felt their passion as well as their power. When the shamisen and taishogoto were being performed, the sound of those instruments resonated throughout the venue, which attracted visitors of the Craft Fair. Also, the Tahiti Nui International performed hula and Tahitian dance which were authentic. In addition, Riatea Helm, who is a singer that received a Grammy nomination performed her songs. Furthermore, both Sugaizanairen and Descendance performed dynamically. Also, there were cultural performances including hula dance which we enjoyed watching the colorful costumes worn by the performers. The performers are moving like Australian animals and performed their unique dance. The dancers performing hula dance in matched colorful costumes. Tahitian dance will make your body move. There was an exhibit of Japanese festivals right next to the stage. The stylish sound of shamisen resonated throughout the venue. Raiatea Helm’s voice captivated the audience. Nankin tamasudare is Japan’s traditional performing arts. The audience were watching various performances. The rain was pouring in the morning but it stopped suddenly and the performances were staged at the new Waikiki Beach Walk. This year, the group Descendance from Australia was first to perform on the new stage. They performed the Australian Aboriginal dance which excited the audience. Also, the audience were called on stage to dance with the hula dancers, who were waiting for their turn to perform. Their performance fitted well with the theme of this year’s Honolulu Festival, “Pacific Renaissance”. In addition, the passersby stopped and gazed at the stage with curiosity. 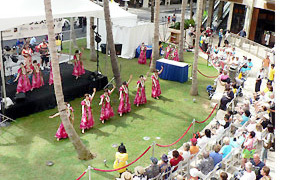 The stage at Waikiki Beach Walk was a place where the colorful costumes of the performers looked bright on the lawn. The performers are dancing with the audience. Descendance and the hula dancers performed together. The shade of the palm trees sets the mood. The restaurants located at Waikiki Beach Walk participated as well. The Japanese high school students showed such a youthful performance. There were food booths on the side of the stage. The hula dancers were waiting for their turn. The Japanese folk song was performed along with Tsugaru jamisen. There were full of smiles at the venue. There was a gentle light coming from the stairwell of the Ala Moana Center which brightened up the Centerstage. Many weekend shoppers were attracted by the music played on the stage. Furthermore, there were many hula groups from Japan this year as well. We enjoyed watching their bright colored costumes and beautiful dance. The locals were watching hula with friendly eyes and they gave a big round of applause to those dancers who were enjoying and dancing earnestly. Also, there were unique performances from Japan including the beautiful taishogoto, energetic dance by the Japanese high school students and Nankin tamasudare which is Japan’s traditional performing arts. Moreover, the participating groups from various Asia-Pacific countries other than Japan are increasing each year. The group Descendance from Australia performed the Australian Aboriginal dance and Chum Sa Rang from Korea performed traditional Korean dance. 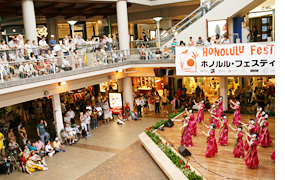 There were various cultural performances from each participating country which entertained us on the Centerstage of the Ala Moana Center. The traditional Korean dance was performed by the children. Yasuko Shimizu and Her Fellow Singers sang in a light voice. During the performance of the Korean drumming, its sound resonated throughout the venue. They are Hula halau from Japan. The traditional Korean dance was performed elegantly like a heavenly maiden. There was a lot of audience at the venue who came to watch the performances.